Finding Termites in Your Home - Look to Termite Control - Yes Pest Pros, Inc. Finding Termites in Your Home - Look to Termite Control - Yes Pest Pros, Inc. There is no pest in today’s world that is as invisible as termites and as potentially devastating. With other pests, you walk in on them at night or wake up with bites on your arm, but with termites, people have been known to live with serious infestations for months without realizing it until their home begins to fall down around them. If you have a termite control issue, you must look for the warning signs before it is too late. First, you need to inspect your walls for possible problems. One tell-tale sign that many termites leave behind is tracks. They will look almost like muddy little footprints up and down your wall or across your ceiling. Many people notice them at night when they are lying in bed or when the light is just right in a certain room. In bright sunlight, the tracks can be next to impossible to see. There are even stories of people discovering them by accident and not realizing what they were until later on. If it appears that an army of impolite bugs have left footprints across your ceiling, it may be time to call a termite pest control expert. For many folks who have termites, the first impulse is to start punching holes through walls to see if there is a termite buffet going on inside. This, of course, is a bad idea since you never know where the bugs might be and holes are difficult to replace. Instead, if you think you’ve found an infested area, knock on the wall and see how it sounds. A full, solid sound means healthy wood, a hollow sound means you could have trouble. 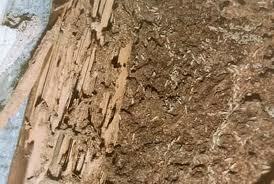 Termites like to burrow inside wood and eat it from the inside out. Sometimes, simply looking at a piece of wood gives you little to no insight on what’s going on inside. Finally, termites shed their wings as they mature and while they can do a great job of hiding from plain view, they have been known to leave their wings around in piles. If you finding odd little milky-white shaded wings, you need to call termite pest control immediately. Termites can give off a dangerous gas as they consume wood and breathing in that gas could make you sick. Do not hesitate to call the termite control professionals at Young Environmental Solutions if you think you have a problem.